After claiming victory in Turkey's historic referendum on constitutional amendments, President Recep Tayyip Erdoğan is set to make critical visits to India, Russia, China and the United States as well as attend a NATO meeting in Brussels in May in an intense diplomatic schedule, where he will meet world leaders. President Erdoğan went through a busy schedule ahead of the referendum on April 16, where he held rallies in support of the "yes" campaign almost every day, at times participating in a few rallies a day. The historic constitutional amendment package was approved by the people of Turkey, according to unofficial results, with 51.41 percent for "yes" votes, while the "no" votes stood at 48.59 percent. Voter turnout was 85.46 percent. India: India is the first stop on Erdoğan's diplomatic route. The president will depart on April 30 to attend the Turkey-India Business Forum. During the visit, the agenda is expected to be mainly focused on bilateral trade and economic cooperation between the two countries. Erdoğan will also meet Indian President Pranab Kumar Mukherjee, Vice President Hamid Ansari and Prime Minister Narendra Modi. India is Turkey's second largest trading partner in the Asia-Pacific region. A Joint Study Group was set up in 2010 in order to explore the feasibility and possibility of concluding a Comprehensive Economic Partnership Agreement between Turkey and India. From Jan. 1, 2016 to March 31, 2017, Turkish exports to India increased by almost 69 percent, according to data compiled by the Turkish Exporters Assembly. The number of tourists coming to Turkey from India has steadily increasing in recent years. In 2012, 73,731 Indian tourists visited Turkey, this number rose to 90,934 in 2013, 95,014 in 2014, and 131,250 in 2015. Meanwhile, the fight against the Gülenist Terror Group (FETÖ) will also be discussed during the visit. Russia: Erdoğan's second stop is the Russian city of Sochi, where he will meet Russian President Vladimir Putin on May 3. 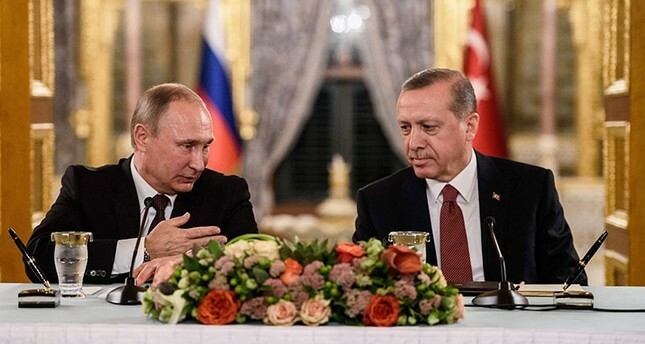 Russian-Turkish relations soured over the downing of the Russian jet by Turkey on the Syrian border in November 2015 for a violation of Turkey's airspace, but they have improved since Erdoğan's visit to Russia in August last year. Turkey voiced regret over the unfortunate incident and the government has been taking steps to ease the tensions between the two neighbors. Both diplomatic and economic relations were affected by the downing of the Russia jets, where the two states took steps against one another, including economic sanctions. Among the main issues, the Syrian crisis and Turkey-Russia trade, economic, and energy related issues are expected to be discussed in the meeting between Erdoğan and Putin, where a large delegattion of ministers are expected to accompany Erdoğan. Despite a disagreement over removal of Syria's Bashar Assad, Turkey and Russia have been taking the lead in the peace talks launched in Kazakhstan's capital Astana. Ankara has criticized Russian support to Assad, claiming that Syria's political crisis will be solved by the removal of Assad, who recently attacked civilians with chemical weapons, resulting in condemnation from the international community and a U.S. missile attack on the base used for the attack. Erdoğan and Putin last met in Moscow on March 10, during the Sixth High-Level Cooperation Council Meeting, where agreements in energy, trade, intellectual property were signed. In addition a significant memorandum of understanding was signed to establish a joint investment fund between the Russian Direct Investment Fund (RDIF) and the Turkish Wealth Fund (TWF). The fund was designed in an effort to boost bilateral investment flow between the two trade partners, who are heavily dependent on each other. Meanwhile, Turkey has been making efforts to establish passport-free travel with Russia to make it easy for business and tourism-related travel. Russian tourists have significant importance for Turkey's tourism sector. Another significant trade sector between the two countries is also the defense sector. In recent days, Turkey has been in talks with Russia to purchase the S-400 defense missile systems. Similar to the historic Silk Road, the new project aims to increase the connectivity of trade routes between Asia and the European continent, through 65 countries. The forum will also be attended by regional state leaders, such as Russian President Putin, Philippines President Rodrigo Duterte, Pakistani Prime Minister Nawaz Sharif and Indonesian President Joko Widodo. With the modern silk road the distance between China and Turkey for trade transport decreased from 30 days to 10 days, through newly established and modernized routes. The One Belt, One Road project, which will be launched on May 15, is expecting to create a $21-trillion trade cycle. Turkey has also built significant projects to integrate itself into the route, including the EuroAsia tunnel, Yavuz Sultan Selim Bridge, Baku-Tbilisi-Kars and the Edirne-Kars railway projects. The possibility of Turkey's membership in the Shanghai Cooperation Organization (SCO) has also been supported by China. Chinese officials have recently voiced a willingness to consider an application from Turkey to join a Russian and Chinese-led security bloc. Ankara has also voiced weighing the option. China is also among the first 20 destinations for Turkey's exports. SCO was formed by China, Russia, Kazakhstan, Kyrgyzstan, Tajikistan and Uzbekistan in 2001 to fight terror threats. First meeting with U.S. President Trump: Erdoğan will travel to the United States on May 16 to meet with U.S. President Donald Trump in a two-day-visit, the first meeting between the two leaders of strategic NATO allies. Both leaders spoke over the phone after Trump was elected and after the referendum in Turkey, in addition to increased diplomatic traffic between the two countries, however they have not yet met face to face. Despite the souring relations and increased tensions between the two states during the reign of former U.S. President Barack Obama, both Trump and Erdoğan have made signals on re-establishing relations. The Trump-Erdoğan meeting is expected to set the tone for future U.S.-Turkey relations on several issues, most importantly the fight against terror groups, such as the PKK, Daesh and FETÖ. The relations between Ankara and Washington soured during the Obama administration when the PKK terror organization's Syria-affiliate the People's Protection Units (YPG) was labeled by the White House as the most effective partner in the fight against Daesh in Syria. Turkey on numerous occasions reiterated that the YPG's presence in northern Syria as an armed group constitutes a national security threat to Turkey and that Ankara will not allow the establishment of a terror corridor along its borders. The U.S. claims that it supports the Syrian Democratic Forces (SDF), despite the group being predominantly led by the YPG. Turkey argues that the support given to the YPG in Syria ultimately is transferred to the PKK, and used against its citizens. The PKK is recognized as a terror group by both U.S. and the EU. Another issue that will be at the center of the Erdoğan-Trump meeting is the extradition of the U.S.-based FETÖ leader Fetullah Gülen from Pennysylvania, U.S. to Turkey. Ankara has accused the U.S. of turning the issue political , as the U.S. has delayed the extradition process despite Turkey providing boxes of evidence linking Gülen to the July 15 coup attempt in Turkey. On Thursday, Erdoğan said that Obama failed to keep his promises and that the Turkey hopes the Trump administration will not make the same mistakes. The failed July 15 coup attempt, which left 248 people dead and nearly 2,200 injured, was organized by followers of Gülen, who has lived in self-imposed exile on a 400-acre property in the foothills of the Pocono Mountains in the U.S. state of Pennsylvania since 1999. Attendance to NATO summit: Erdoğan will also attend the NATO member states leaders' summit on May 25 in Brussels. During the summit, Erdoğan is expected to provide signals on the new roadmap of relations between Turkey, a key NATO ally for the organization, and the EU states. Turkey-EU relations have also soured in recent years as Ankara accuses the bloc of turning a blind eye to terror groups, such as the PKK, the Revolutionary People's Liberation Party-Front (DHKP-C), and FETÖ. Meanwhile, Ankara also argues that EU states have been utilizing anti-Turkey rhetoric to gain advantages in domestic politics. Erdoğan is expected to meet with the European Commission President Jean-Claude Juncker and the European Council President Donald Tusk. Turkey and the EU signed a refugee deal in March 2016, which aimed to discourage irregular migration through the Aegean Sea by taking stricter measures against human traffickers and improving the conditions of nearly 3 million Syrian refugees in Turkey. The deal included a 6-billion-euro aid package to help Turkey care for the millions of refugees hosted in the country. Despite the promise made, Ankara has said that only about 700 million euros have been delivered. In addition, the promise of acceleration of Turkey's EU membership bid and visa-free travel for Turkish nationals within the Schengen area has also not been kept by the EU.